Final preparations are being made at historic Kirkstall Abbey for this weekend’s spectacular Classical Fantasia. The performance of open-air classical music set in the grounds of the 12th century abbey takes place from 8pm on Saturday 1 September and will feature fantasy-inspired music performed by the Northern Ballet Sinfonia accompanied by the now-famous spectacular illumination of the ruins and electrifying fireworks. Gates will open at 6pm for the event organised by Leeds City Council which is now in its 17th year and supported by media partners Magic 828 and the Yorkshire Evening Post. “I am really pleased that Magic 828 are involved and proud to be supporting Classical Fantasia again this year. It’s such a fantastic and unique annual event for Leeds, our listeners love it! I’m really looking forward to introducing John Pryce-Jones and the Northern Ballet Sinfonia to the stage on Saturday. 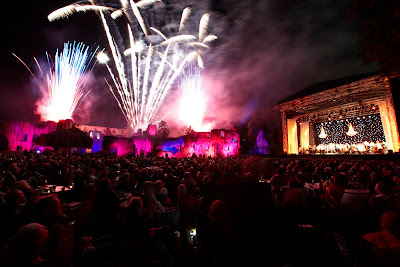 It’s set to be a wonderful occasion for everyone; the unique combination of classical music, fireworks and the stunning illumination of the historic abbey ruins is so special. " Remaining tickets are available to purchase from the City Centre Box Office at The Carriageworks off Millennium Square (0113 224 3801) , Leeds Visitor Centre at Leeds Rail Station (0113 242 5242). Subject to availability, a limited number of tickets will also be available from Abbey House Museum up to 8pm on the day at the venue. Tickets are priced at £7.50 for LEEDSCard holders, £6.50 for LEEDSCard Extra holders and £5 for Breezecard holders. General admission is £10 or £35 for four tickets for small group bookings of family/friends. For the latest information on the event including travel details visit www.leeds.gov.uk/fantasia. Anyone requiring further information can also contact Leeds City Council’s events team on 0113 396 0891 or by email at events@leeds.gov.uk. A booking/transaction fee will apply to bookings made online or by telephone.